MassResistance allies to confront "Day of Silence"
Message to parents: Keep your kids home that day! 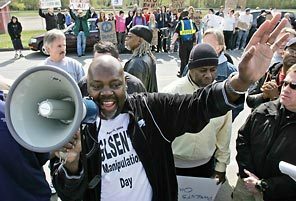 MassResistance has allied with 22 pro-family groups across America to confront the homosexual propaganda event "Day of Silence", which is being held in public schools across America - and particularly in Massachusetts - on Friday, April 17, 2009. The theme of the action is Day of Silence Walk Out. The message to parents is: Keep your kids home that day, and let the school administration know why you're doing it. The action is being spearheaded by the Illinois Family Institute. During the Day of Silence, which has become an annual day-long event, school officials encourage students to be silent for the entire day as a sign of solidarity with the homosexual activist movement. Students are encouraged to wear special homosexual badges, stickers, and bracelets which are often handed out at all the school entrances that day. There are also pro-homosexual posters and handouts, and even workshops. The schools use various psychological methods during the day to attempt to create a strong bond with the homosexual movement in the minds of the kids. The Day of Silence is organized nationwide by the Gay Lesbian Straight Education Network (GLSEN), a well-funded national homosexual organization that targets children in the public schools. In Massachusetts, the Day of Silence is also funded by tax dollars, through the Massachusetts Commission on Gay Lesbian Bisexual and Transgender Youth, which this year received $850,000 of public money. The Massachusetts General Laws specifically require that Boston chapter of GLSEN be an official member of that state commission! Although GLSEN attempts to portray the Day of Silence as "student run", it's always organized by adults, usually homosexual activists on the school's staff. Often at a school, the Day of Silence is immediately followed a "Day of Remembrance" or some other pseudo-event, in order to extend the homosexual theme. Last year, 495 students stayed home from Mt. Si High School in Seattle during the Day of Silence after Pastor Ken Hutcherson of Antioch Bible Church spread the word. The incident made national news. Seattle Times: "Mount Si's gay-rights Day of Silence is far from quiet"
During the Day of Silence in 2007, MassResistance helped organize a counter-event, the Day of Defiance, at several schools in the Boston area. When parents came and demonstrated at the Day of Defiance at Brookline High in Brookline MA, pro-homosexual school staff incited hundreds of kids to go outside and storm the parents, staging a near-riot which required police presence. THIS YEAR: JOIN the WALK OUT! The walkout was particularly successful in Seattle last year, and in other places (even in Massaachusetts) it has made some impact when organized. Help spread the word to as many parents around the country! Pastor Ken Hutcherson got it done last year!